The Big Bends Axe Sack is the ultimate collection of Big Bends guitar care products. With 25 string wipes, an AXS Wipe microfiber cloth, 2oz. bottle of Gloss Sauce polish, 1oz. 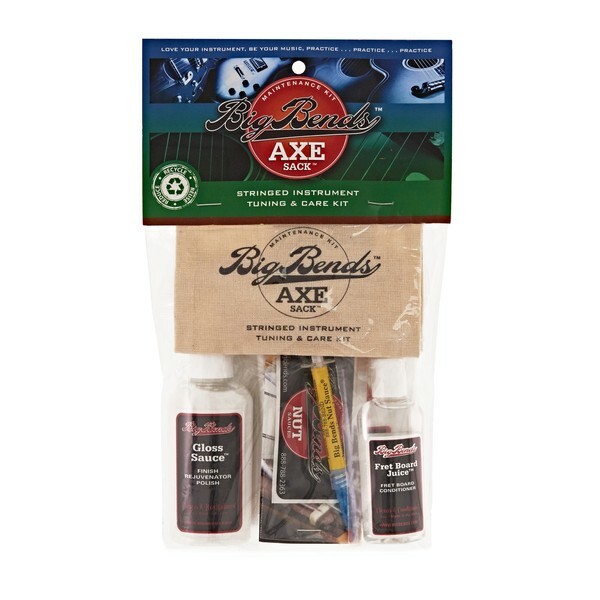 bottle of Fret Board Juice, a 0.5cc Lil Luber syringe of Nut Sauce, a sticker, and a handy Axe Sack carry bag, you have everything you need to get your instrument looking and performing like brand new.